Every once in awhile a very special vacation rental comes along in London, and it is with great pleasure that we introduce the Marlborough in Notting Hill. This charming two-bedroom home is set in a peaceful mews just around the corner from Notting Hill’s most exclusive and chic area at Ledbury Road and Westbourne Grove. If you’re not familiar, a mews is the narrow and often cobblestoned street where the stables were once located for the larger houses on the main streets nearby. If you’re thinking “chic” and “stables” don’t really sound like they go together, then you haven’t yet explored the charming mews in Notting Hill, Kensington and Chelsea. With their historic charm, quiet setting off the main streets and private home feeling, mews homes are now among the most expensive property in London – often selling for millions of pounds in the best neighbourhoods. 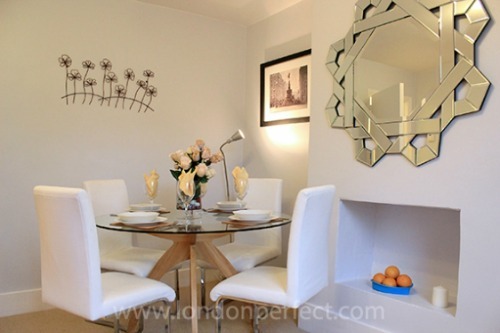 And the Marlborough certainly boasts the very best of neighbourhoods in Notting Hill! Step out your front door to the mews and turn the corner to find a pretty tree-lined street with boutiques, restaurants and cafes. This is Ledbury Road in Notting Hill and just beyond you’ll spot Westbourne Grove. 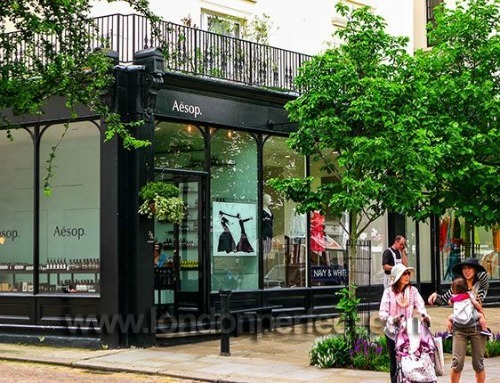 You’ll be right in the heart of the most exclusive shopping area in Notting Hill. With tons of restaurants, outdoor dining spots and just a short stroll from Portobello Road, the Marlborough is a most charming home base for experiencing the best of Notting Hill. Come along and take a peek inside with us! The Marlborough is located in a two-level mews, so when you enter you’ll find an entryway with steps leading up to the upper level. There you’ll find the two bedrooms, a large kitchen, living room with dining area and a full bathroom. The rooms have been decorated with a cheery mix of colours, contemporary decor and comfortable furniture. 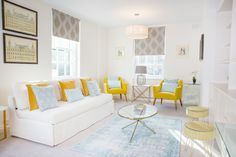 Enjoy leisurely evenings at home relaxing in the living room or enjoying a dinner at home with your family and friends. The kitchen has been fully remodelled and features a breakfast bar built in on one side. 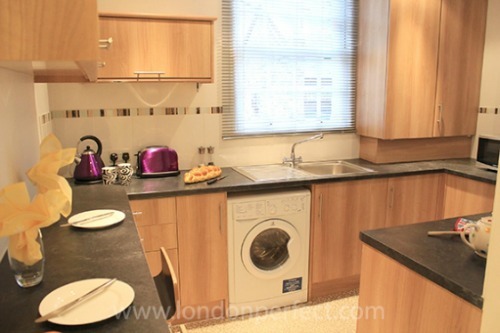 It’s a well designed kitchen with modern appliances and loads of light from the large window. Head to the local Portobello Road food market or shop at one of the great food shops in the neighbourhood for all the fresh ingredients for dinner at home. After a day of sightseeing and walking in London, both kids and adults alike can be worn out. 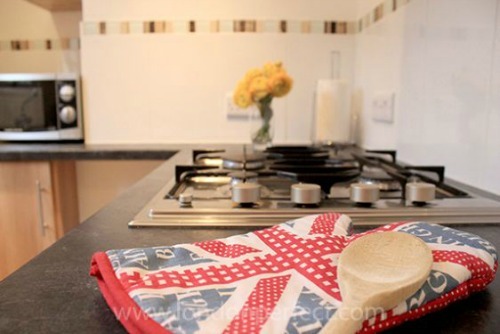 It’s lovely to have the option to pick up something already prepared or prepare a meal at home if you enjoy cooking. After a relaxing evening you’ll be refreshed for another day exploring London! The master bedroom at the Marlborough is a peaceful haven for a good night’s sleep. 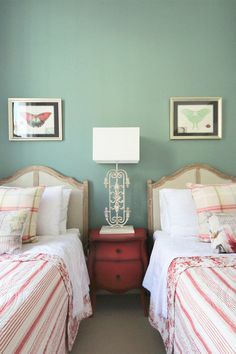 It features a queen size bed, nice storage space and is a cosy spot for relaxing before switching off the bedside lights at night. Sweet dreams … of London! In the second bedroom you’ll find a double bed, built-in wardrobe and dresser for storage and mirror. 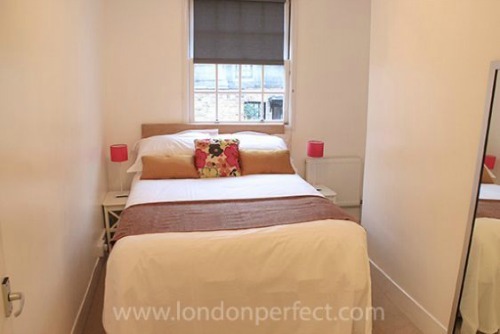 Both bedrooms are comfortable and very nicely appointed in this London mews home. The upper level also has a full bathroom with a bathtub and shower combination, toilet, sink and large mirror. Everything has been cleverly designed in this mews home to maximize space and create a warm and welcoming home in London. 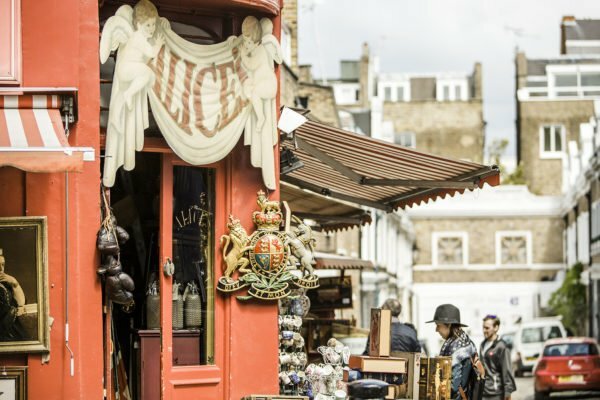 One of the best parts about staying in Notting Hill is being close to the fun Portobello Road where you’ll find the famous Antiques Market, tons of antique shops and a lovely fruit and vegetable and food market every day from Monday to Saturday. 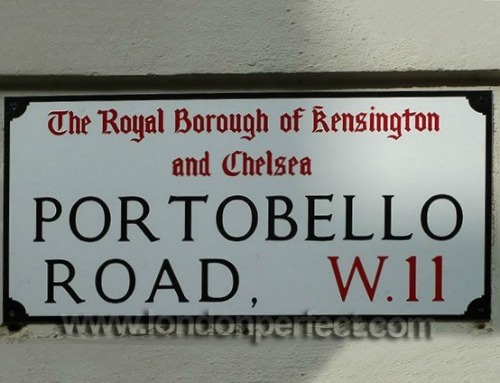 Whether you’re looking for ingredients for dinner, freshly baked bread or just love poking through antique shops looking for treasures, you’ll love Portobello Road! The Marlborough is just about two blocks from Portobello Road, where crowds flock for the Saturday morning market, one of the most famous antiques markets in the world. When we say crowds we really mean crowds, but staying at the Marlborough you can stroll over early to browse the stalls and colourful shops before it gets busy. Beat the crowds to the Saturday morning antiques market on Portobello Road! 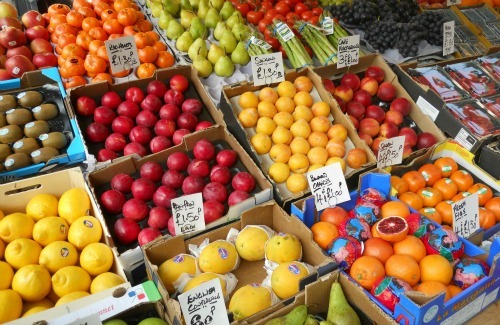 The fruit and vegetable market on Portobello Road is where the locals come to pick out the freshest ingredients. The displays are as gorgeous and colourful as the buildings of Notting Hill! Stop by in the evenings to pick up some fresh fruit for breakfast the next morning at the Marlborough. 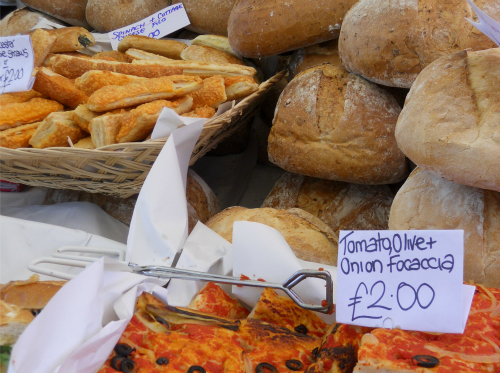 You’ll also find fresh baked bread and other delicious treats along the Portobello Road food market. You can swing by in the morning to make a picnic to enjoy in nearby Kensington Gardens. While walking along Portobello Road, don’t miss seeing where the movie “Notting Hill” with Hugh Grant and Julia Roberts was filmed. 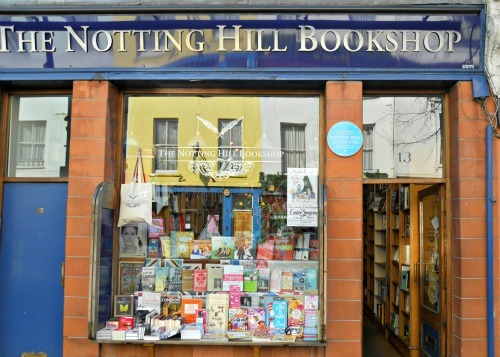 The Notting Hill Bookshop is located at 13 Blenheim Crescent just off Portobello Road. If you love cookbooks, pop into Books for Cooks just across the street, which is one of the most charming cookbook stores we’ve ever soon! 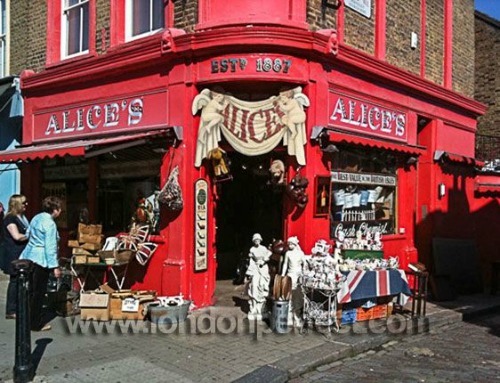 In addition to all the antique shops, you’ll also find some lovely boutiques along Portobello Road selling fashion, home decor and lots of little shoe shops. After exploring Portobello Road, head back to the area right around the Marlborough where you’ll find gorgeous shops along Ledbury Road and Westbourne Grove. 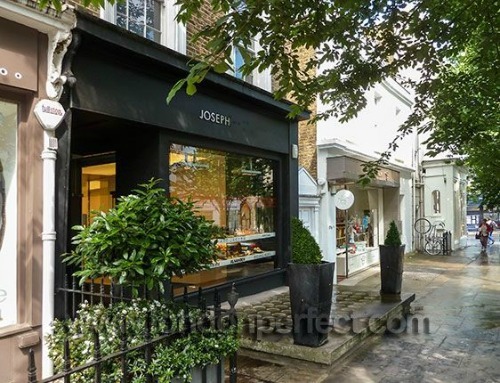 This is an absolutely lovely shopping area – one of the prettiest in London! You’ll love exploring the neighbourhood and browsing in the shops. When you’re ready for a shopping break, simply stop back by the Marlborough nearby or find a charming outdoor cafe on a sunny day. 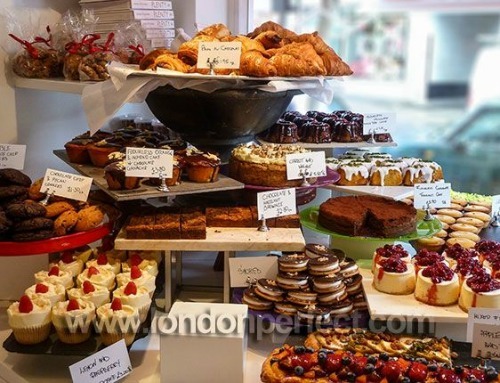 Ottolenghi is one of the most popular spots in the neighbourhood with locals. There’s a tiny dining area tucked away in the back, but many people stop in for the gourmet take away to enjoy at home. 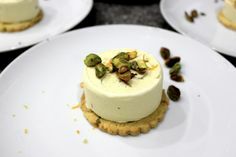 They have tempting displays of baked goods and desserts every day as well as a changing menu of very tasty meals. If you don’t feel like cooking, simply stop by Ottolenghi on your way home for a lovely dinner at home at the Marlborough! Feel like dining out? Well, that’s a piece of cake in Notting Hill. 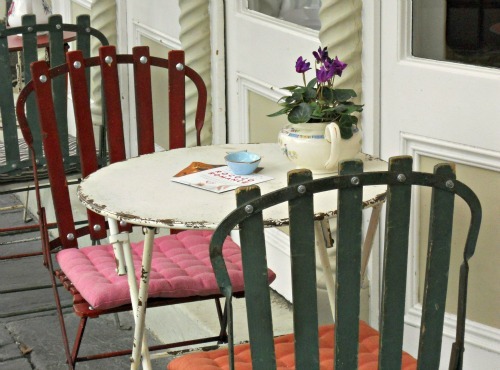 There’s a great selection of restaurants, classic London pubs and cute cafes nearby. You’ll be just down the street from Beach Blanket Babylon, a trendy dining spot with celebs and locals alike in Notting Hill. You’ve simply got to see the decor to believe it … out of this world cool! 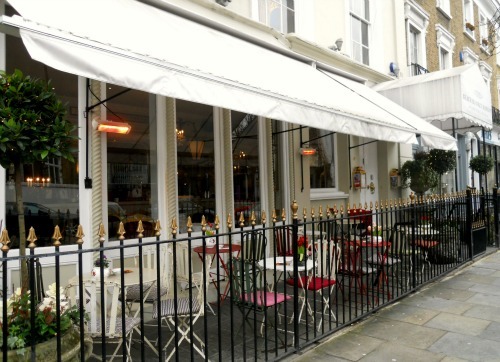 They also do a popular brunch at Beach Blanket Babylon, which is particularly nice if you can get an outdoor table on a sunny weekend in Notting Hill. It’s one of the best places to soak up the Notting Hill atmosphere, and it’s just by the Marlborough mews home in Notting Hill! After you’ve explored Notting Hill, head over to nearby Kensington Gardens where you can stroll through the park, walk along the ponds and lakes, let the kids run and play and visit the beautiful Kensington Palace. This is a real working palace where Queen Victoria grew up and where many members of the royal family have lived, including Princess Diana. 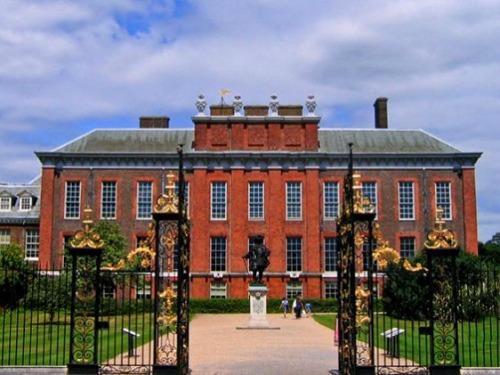 It is now the official royal residence of her son Prince William and his wife Kate, the Duke and Duchess of Cambridge. 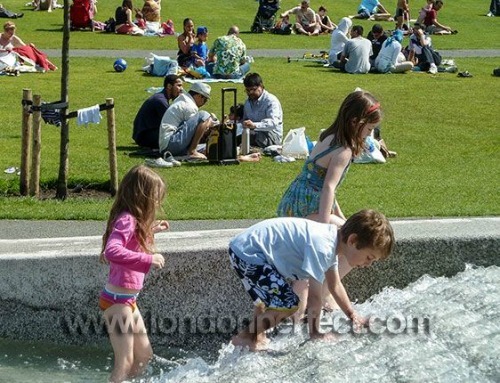 There are several playgrounds in Kensington Gardens and the fun Princess Diana Memorial fountains that kids loving playing in when the weather is warm. 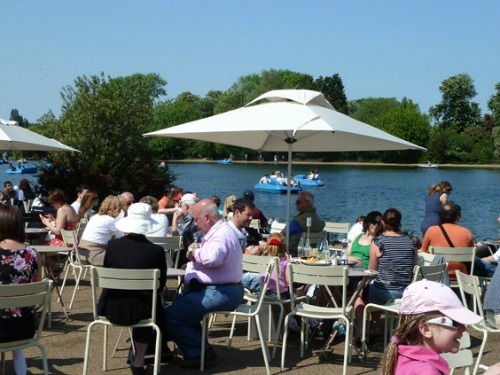 When the weather is nice the cafes along the Serpentine in Kensington Gardens are packed with people enjoying the sunshine, watching the paddleboats splutter past and enjoying being surrounded by such a beautiful park right in the heart of London. After you’ve explored the neighbourhood, it’s easy to reach all the other top spots in London from the Marlborough. It’s just a short walk to the Notting Hill Gate Tube station where you can conveniently catch the Central Line direct to Oxford Street for shopping and St. Paul’s Cathedral or the Circle and District Lines to High Street Kensington, the museums in South Kensington, Sloane Square in Chelsea, Westminster Abbey, the Tower of London and so many more spots. 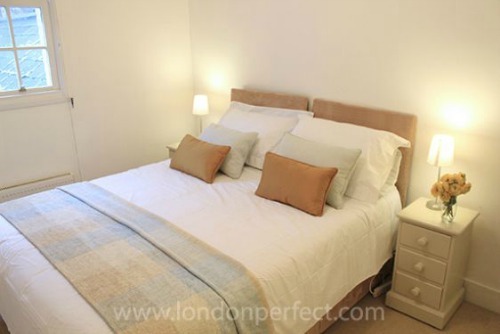 To find out more about the Marlborough, visit the London Perfect website here. 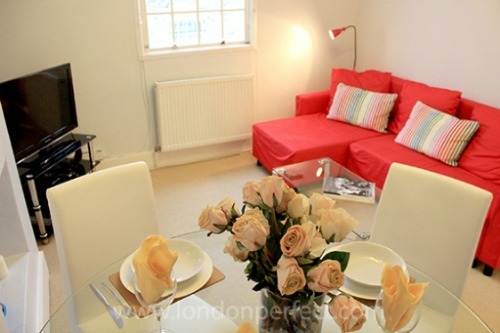 Or simply Contact Us to plan your holiday in Notting Hill! PREVIOUS: The Best Way to Get Around London – On the Bus! Posted on Thursday, February 21st, 2013 at 12:01 pm in Apartment Rentals. You can follow any responses to this entry through the RSS 2.0 feed. You can leave a response, or trackback from your own site. I stayed at the Gladstone last November with my husband and sister and we thoroughly enjoyed our stay. I am planning a trip to London for March of 2014 with my two friends and our 3 teenaged daughters. The Marlborough looks lovely and the location is fantastic. Would the Marlborough work for our group of six? If not, what properties would you suggest? How early should we be booking? Hello Terri, Thank you for your lovely comment! We’re so happy you enjoyed your stay in the Gladstone apartment last November. We would love to welcome you back on your next visit to London! The Marlborough is absolutely charming, but it only sleeps up to four guests. 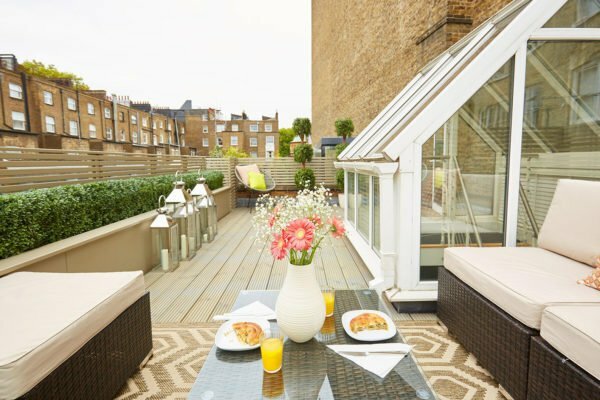 If you would like to experience the mews home setting, do visit the Horton in Kensington, which welcomes up to 6 guests and has a fabulous setting! I also invite you to drop a line to our friendly reservations team at [email protected] for more ideas and information. We strongly recommend booking well in advance, especially for larger apartments as they fill up very quickly. We look forward to helping you plan another perfect stay in London!